The source print is from A Cabinet Of Quadrupeds by John Church, 1805. The artist is Julius Caesar Ibbetson and the engraver is James Tookey. A view of the side of the soup tureen. The pattern is a combination of stylized leaves and flowers against a diamond background. There is a country scene in a cartouche under the handle. An earthenware soup tureen printed with the Arabian Camel pattern. The cartouche is surrounded by a diamond or crosshatch pattern. The lid is patterned with stylized leaves and flowers against a diamond or crosshatch background. The finial is a molded rose. The ladle features the The Running Dog or English Setter pattern which is found in this exhibition along with a 5.12 inch plate. 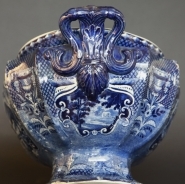 The under tray features the Hare pattern, also seen in this exhibition. The same Arabian Camel pattern appears on the other side of the tureen. The height of the tureen, lid and under tray is not known. For other examples in the Quadrupeds Series, click here.